Watercress (Nasturtium officinale) is a high-nitrate vegetable that is often used in salads, sandwiches, and other recipes. The semi-aquatic plant is native to Europe and Asia but is currently grown all over the world. It is recognized as being one of the oldest known vegetables consumed by humans. Watercress benefits the body in a number of important ways. Watercress is mostly water, so you won't consume many calories if you add it to your meal. A 1-cup serving of watercress (about 34 grams) provides just 32 calories, according to USDA data. There is slightly less than 1 gram of protein (0.78 gram), less than one-half gram of carbohydrate, and almost no fat in a serving of watercress. The glycemic index and glycemic load of watercress is estimated to be zero. Vitamins in watercress include vitamin A (22 percent of your recommended intake), vitamin C (24 percent), vitamin K (106 percent), and small amounts of folate, choline, and vitamin E.
Minerals in watercress include calcium (41 mg), magnesium (7 percent), phosphorus (20.4 mg), potassium (112 mg), sodium (13 mg), and small amounts of manganese and selenium. Watercress is a naturally fat-free vegetable and is a great way to add crunch and flavor to your favorite salads and sandwiches. If you are watching your waistline, it's also a great way to add volume to your meal without derailing your diet. Watercress taken by mouth has also been used as an aphrodisiac, a laxative, and to stimulate abortion. Topically, watercress has been used to treat arthritis, rheumatoid arthritis, earache, eczema, scabies, and warts. It should be noted that there is not enough human research to support the use of watercress for any of these purposes. Researchers have confirmed the phytonutrient composition of watercress. Phytonutrients are known to benefit human health by protecting the cells from disease. And some studies have also linked consumption of watercress to a decreased risk for cancer. There is even some evidence suggesting that watercress consumption may provide health benefits for smokers. You'll find watercress in the produce section of most grocery stores. Look for a bunch of watercress (often packaged in plastic) that has bright, green, crisp leaves that are free from spots. What's the best way to store watercress? If you don't use watercress right away it should be stored in the refrigerator. Lay watercress leaves on paper towel and roll loosely before placing in the fridge. Watercress doesn't freeze well. The leaves are likely to lose their crisp texture when frozen. Watercress has a mild taste (although some people taste a hint of pepper). So this veggie pairs well with almost any salad or sandwich ingredient. Popular watercress salads are those that also include apple, avocado, and other fresh greens like arugula, spinach, or mache. You can also add watercress to soups, use it to top deviled eggs, add it to spring rolls and wraps, or in your favorite stir-fry recipe. 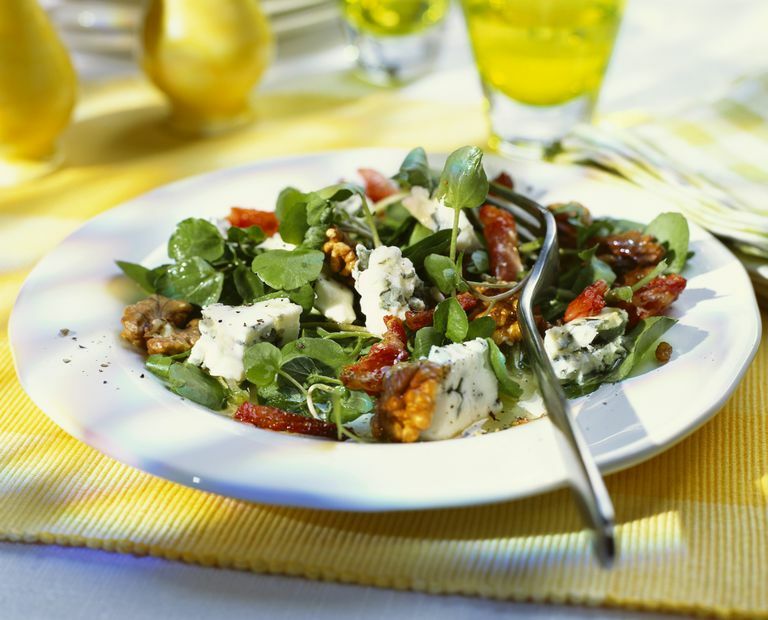 When consumed in typical amounts found in food, watercress is likely safe for most people. However, if overconsumed it may cause stomach upset or kidney problems in some people, according to the Natural Medicines Comprehensive Database. The source recommends that people with kidney disease, stomach or intestinal ulcers avoid watercress. They also advise children and pregnant or breastfeeding women avoid using watercress for medicinal purposes. Lastly, persons taking Warfarin (Coumadin, lithium, or Chlorzoxazone) may want to speak to their healthcare provider before using watercress. Chris IR Gill, Sumanto Haldar, Lindsay A Boyd, Richard Bennett, Joy Whiteford, Michelle Butler, Jenny R Pearson, Ian Bradbury, Ian R Rowland; Watercress supplementation in diet reduces lymphocyte DNA damage and alters blood antioxidant status in healthy adults, The American Journal of Clinical Nutrition, Volume 85, Issue 2, 1 February 2007, Pages 504–510. DOI: 10.1093/ajcn/85.2.504. Hecht SS, Carmella SG, Murphy SE. Effects of watercress consumption on urinary metabolites of nicotine in smokers. Cancer Epidemiol Biomarkers Prev. 1999;8(10):907-13. Watercress. Professional Monograph. Natural Medicines Comprehensive Database. 01/05/2018.